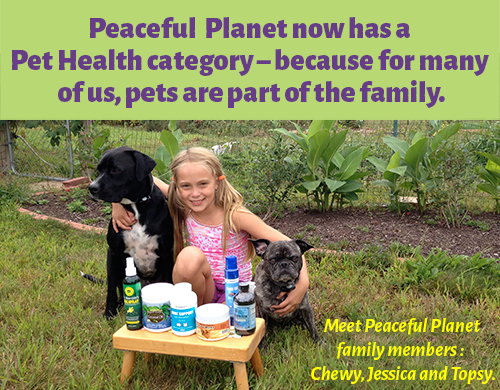 Nourishing World is pleased to announce our brand-new Pet Health category! This section of products is just starting out, and will be growing larger in the coming months. We know how important your pets are to your family, and we want to be sure to provide you with eco-friendly, natural products for your beloved dog or cat. In addition to our regular health and wellness blog posts, we will also be bringing you posts centered on holistic pet health and non-toxic pet care. Coconut oil benefits pets in the same ways it benefits humans. Choose either Green Pasture Blue Breeze Virgin Coconut Oil or Perfect Coconut Oil, both of which are organic. Green Pasture Skate Liver Oil promotes smoother skin and a shinier coat, and can aid in preventing or treating arthritis in pets. Mercola Bug Spray, which is safe for children, adults, and pets — so you only need one bottle on your next hike, camping trip, or family outing! The Splish Splash Natural Bath Filter removes chlorine from your pet’s bath; this is healthier and safer for all pets, but especially important for those with allergies or dry, sensitive skin. Check out all of our current product offerings and keep an eye out for new products. Comment below to let us know what pet supplements or pet health information you are looking for!